See those guys in blue uniforms? Their job is to stand there like human bollards until the massive crush dies down, making sure the mob getting off the inhumanly packed morning train doesn’t block the people scampering to catch their ride going in the opposite direction, out to the burbs. 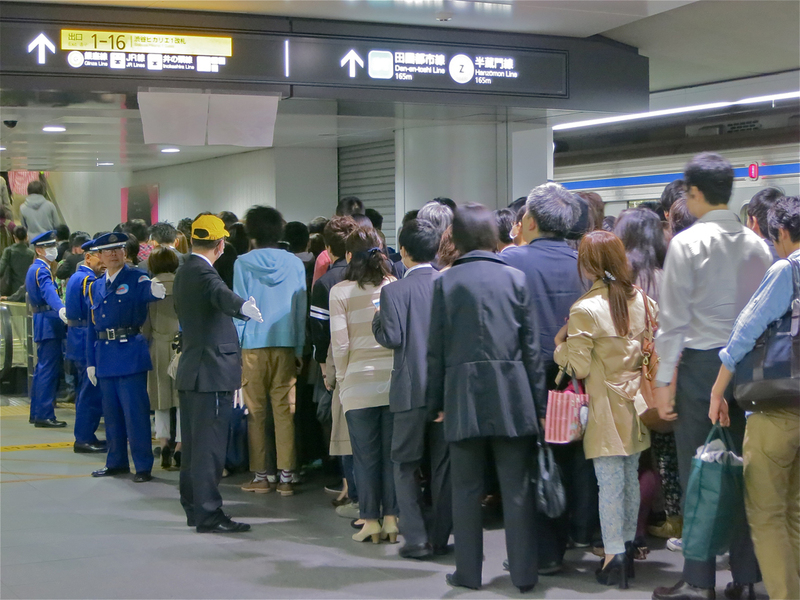 This is rush hour at Shibuya Station’s new Toyoko Line platform. On this particular day, the trains had been delayed by something at Jiyugaoka, so the blue suit guys were joined by a black suit guy, whose job was to loudly apologize to the arriving commuters for the train delay. It wasn’t enough of a glitch to warrant a Get Out Of Work Free Card, but it was enough that the commuters were all on the edge of surliness. Yikes! I am sooooooo glad I don’t live on the Toyoko Line anymore. You are SO lucky! It has been just wretched since they switched the shuten over to the Fukutoshin line at Shibuya. >_< Don't get me started, but let's just say you'd better have on your hiking boots if you're even vaguely considering transferring to the Ginza, Inokashira or Yamanote lines. And the escalators are so narrow, you have to slowly slowly ride up from the terminus near the center of the earth instead of walking. Bleah!